What are some of the most popular uses of square table covers? The linen sets are made of durable material unlike cheap, plastic overlays. The polyester fabric is designed for machine washing and hand cleaning after each use. The basic color options make it easy to match the covers to any setting or décor. 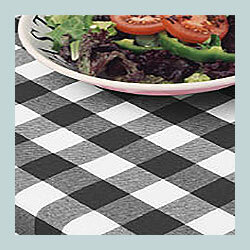 The tablecloths are great for use in cafes, restaurants, bistros and outdoor dining locations. The square table covers can be layered with matching napkins and placemats for a uniform and professional display. 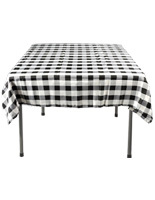 The reusable quality of the tablecloths makes them budget-friendly and economical! Choose from different colors and sizes to perfect fit any table. The thick polyester fabric also hides any imperfections, stains or discolorations on tables and counters. The uniformity and wrinkle-free design make the coverings perfect for any setting or any surface. The checkered pattern or solid colors can be bought to match any setting! Where can these square table coverings be used? Italian restaurants and bistros often use the traditional red and white checkered pattern. The more upscale plain black and white linen sets are perfect for buffets, wedding venues, catering companies and other event halls that need clean, crisp and simple table dressings. 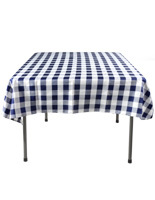 The blue and white checkered pattern cloths are perfect for seaside restaurants or picnic settings! Because of the reusable quality of these coverings, the catering business is one of the biggest industries that benefits from them! The tablecloths can be folded and placed within boxes or carrying cases and will lay flat and wrinkle-free even after travel. The color choices make it possible to use the overlays for buffets, parties, weddings and other corporate events like lunches or award dinners. The overlays can be used in upscale settings or in outdoor, casual settings for BBQ’s or outdoor parties. The polyester fabric is easily washable and can be cleaned with a normal washer and dryer rather than having to be sent for dry cleaning! The affordable and economical tablecloths add luxury and style to any table, counter or banquet-style table!